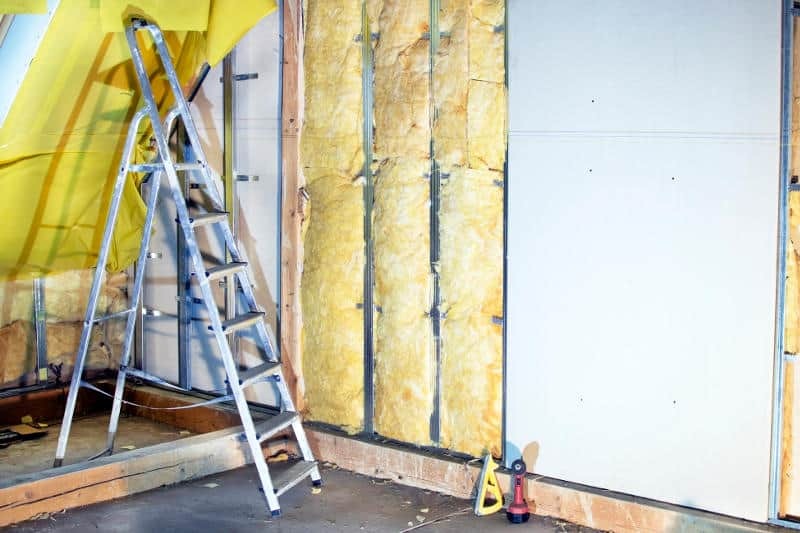 Insulation is a key component to getting the best possible soundproofing in your home. That’s why I’ve decided to go in-depth about this topic and talk about what you can get out of the best soundproofing insulation on the market. In addition to sharing some of the best products you can use on your walls and ceilings, I’ll also explain the basics of insulation. Firstly, it’s important to make the distinction between insulation and other soundproofing materials. If you take a look at the article I’ve linked to, you’ll see that there are plenty of products that can offer similar results. However, I believe that insulation might be the most effective soundproofing material you can use. Various types of insulation are meant to provide different benefits, so I’ll also share some of the main ones you may work with. Although soundproofing insulation is specifically designed to lessen the amount of noise that reaches you — is it really the best option all around? You’ll find out later on in the article. Finally, after I point you to a few products you might like, I’ll also explain how you can install them into your walls or ceilings. But now, without further ado, let’s talk about the basics. Most American homes and apartment buildings technically have cavity walls. Ordinarily, cavity walls have two solid layers and an empty space in between. That empty space is usually filled up with insulation. Going by that explanation, a typical stud wall should qualify as a cavity wall, right? Well, it does. However, although cavity walls are usually constructed with two brick walls with insulation in the middle, American homes come with a special twist. You see, as I’ve explained before, the typical American home is a prefab building. That means that they are made in factories to be constructed on site, which saves money and hastens the whole process. But there’s a major flaw in this system. It leaves us with walls that are oftentimes too thin to provide any kind of privacy on their own. As we’re all well aware of, sound travels very easily through the air. So we need something that will close the space inside of our cavity walls — a task that usually falls on insulation. However, soundproofing isn’t actually the main purpose of insulation. Rather, these fibrous materials are meant to trap air, specifically hot air, looking to escape. Insulation is what keeps your house warm during winter and cool during the summer. But when you put insulation in interior walls, you’re probably doing it to conserve your privacy. Batt insulation comes in rectangular panels or rolls that are typically about as wide as the space between the wooden studs in your walls. They can be anywhere between an inch and several inches thick, and they’re usually made of cotton, fiberglass, or mineral wool (aka rock wool). Blown insulation is most often found in attics. Essentially, this type of insulation is pretty much the same material as the previous type, so fiberglass and cellulose. However, the material is blown in chunks into the space it’s meant to fill. So you see why you can’t very well put it in walls without having it fall apart. Foam spray insulation is much easier to work with. You could even get it inside brick cavity walls without taking them apart. After you spray the liquid polyurethane into the cavity through a small hole, it will expand to fill the space. Then, you can just patch the hole you used to fill the cavity. Out of these three choices, blown insulation is clearly the loser. After all, it’s pretty much only useful for attics that aren’t in use. Foam spray insulation is certainly better, although it’s the most expensive type. So I’m going to focus on batt insulation, which is the most popular kind anyway. In fact, batt insulation works as a sort of concealed acoustic foam. It basically works the same way: by trapping the air (that carries sound) inside of it. After all, sound traveling through walls must move either through the air or by vibrating against the structure of the building. Due to the density and thickness of batt insulation, it tends to resolve both airborne and impact noise — to a point. So where can you get these products? Well, personally, I like to get them on Amazon. If you want to be able to see the products before you order them, you can look at the ones that are on offer at your local home improvement store. You can also browse the sites of the specific manufacturers to find more information about the products on Amazon. There are only a few companies that offer the majority of the batt insulation on the market. You may even know of some of them — so let’s see who they are. You’d be hard-pressed to find a brand of insulation that’s more famous than Roxul. My favorite in their vast selection of products is the Rockwool Acoustic Mineral Insulation. That mineral wool insulation has a density of 8 pounds per cubic foot, which is what makes it such a good soundproofing product. However, there is a slightly cheaper alternative that has a density of 6 pounds per cubic foot. Both of these products come with 6 pieces that are 2 inches thick, 48 inches tall, and 24 inches wide. The wooden studs in your wall should be the same width. As I’ve mentioned, Roxul products are currently the most popular ones on the market. So you can buy them and trust that they’ll perform perfectly. You may know ATS Acoustics as the company behind many of your favorite acoustic foam panels. While they do make their own insulation, they also seem to be a distributor for Owens Corning fiberglass insulation. This Owens Corning 703 insulation is the closest substitute for the Roxul products I’ve mentioned above. It, too, comes in packs of 6, with the exact same dimensions we saw. Even though it only has a density of 3 pounds per cubic foot, it has a perfect noise reduction coefficient. The same product comes in different thicknesses, as well — for example, the 4-inch version comes in 3-piece packs. Lastly, I’d like to mention one more type of insulation from Owens Corning. Their 2-inch Rigid Fiberglass insulation has a Foil Reinforced Kraft layer on one side. Apparently, the foil face is especially effective at blocking mid to high frequencies, while the low end of the spectrum is caught in the fiberglass. As you can see, all of these products come in the same dimensions, only varying in the thickness of the panels. You should be pretty happy with the performance of all of the items I’ve listed. However, you probably also noticed that the market isn’t exactly overflowing with great products. Still, if you need products you can trust, you’ll find yourself gravitating to these two or three manufacturers. Now that I’ve gone over the basics of insulation and a few of my product recommendations, let’s talk about the installation process. The first thing you’ll need to do to prepare for the insulation installation is to clear the room. If you’ve ever painted a room, you’ll know exactly what I mean. Move as many pieces of furniture as you can out of the room. If you’re working on walls, you can group the biggest pieces under a plastic tarp in the middle of the room. However, if you’ll be working on the ceiling, you may have to take all of the furniture out of the room. When all of the furniture is out of the way, you can remove the drywall. Obviously, I assume that you’ll be insulating an existing, decorated room. But if that’s not the case, and you’re insulating a room that is just being built, you’ll have an even easier time. Regardless of whether or not you have drywall that needs to come off, once you reach the wooden constructions in the walls, you can move on to the next step of the preparation process. Before you order any of the products I’ve told you about, you should measure the walls or ceilings you want to insulate. Personally, I’d calculate the height of the walls, the width between the vertical studs, and the number or the hollow slots between the vertical studs. Most batt insulation products come in standardized widths that should fit perfectly in between the wooden studs. These numbers should allow you to calculate the amount of insulation you’ll need. From there, you can get any type of batt insulation: fiberglass, cotton, mineral wool, or cellulose. I wouldn’t try to DIY the insulation that goes into your walls, if for only one reason: it won’t be as heat-resistant as commercial products would. Obviously, in the event of a fire, you don’t want your insulation to hasten your home’s demise. But let’s move away from morbid subjects. You’ll also need to jot down a few more measurements before your insulation arrives at your doorstep. Namely, you’ll want to note where all of the miscellaneous electrical boxes and wires are and how much space they take up. That will allow you to tweak the batt before you put it into the walls. Old clothing. You need to completely cover your arms and legs in case you have an adverse reaction to the materials you’ll be working with. A protective mask, gloves, and perhaps even work goggles. Many of the materials I talked about can irritate the skin, eyes, and even lungs. So protect yourself before you start installing the insulation. A utility knife for cutting the batt insulation down to size and fitting it around electrical boxes. A staple gun to attach the insulation to the wooden studs. Now that you have your gear, you can deal with the insulation. However, if you aren’t planning on installing the insulation as soon as you get it, don’t unpack it. Fiberglass, in particular, may irritate people with breathing problems, as it releases tiny particles into the air when you handle it. That’s why you’ll want to wear all of that protective gear. As I’ve mentioned, the insulation will probably be as wide as the wall studs, so you’ll only have to cut the height you need. You can put the batts in as you cut them, and cut out the pieces for electrical boxes as needed. I actually prefer doing this part with a couple of helpers. I get to cut the batts with another person, while two more push them between the studs and staple them. It just makes the whole process easier. Remember to push the batt with the face pointing toward you. That is, if you purchased insulation that has a clear distinction between the front and the back side. Push and tug the material so that it fills out the entire space. Finally, use the staple gun to attach the paper lining to the wooden stud every 7 inches. A partner should also make this easier. If you want to make your insulation even more effective at blocking and absorbing noise that passes through walls or ceilings, you can add a few finishing touches before replacing the drywall. As I’ve explained in my article on the best wall soundproofing, you can add a layer of MLV over the insulation. If you don’t want to have to get MLV as well, you can achieve a similar effect by plugging the gaps between the insulation and the studs with acoustic caulk. Finally, you can install resilient channels, which I’ve explained in detail as well. After doing all of that, you can choose the right drywall for your walls or ceilings and wrap things up. If everything goes according to plan, you should have a much more secure wall at this point. You might even find that you no longer need some of the other soundproofing tips I’ve been talking about. Once you’ve taken care of the walls and ceilings, you can reduce the impact you have on your floors. You can do that by putting down some floor underlayment. After all, the best kind of soundproofing comes from within the walls, ceilings, and floors. If you soundproof those parts of a room correctly, the only thing you’ll need to worry about is sound echoing through empty space. Thankfully, that kind of problem is easy to solve.